Q:Can this be installed into drywall? We want to place it in our hallway, not at a door, to allow access to multiple rooms. We did not place at door but at top of stairs and it works fine. Q:What is the maximum opening at the top of the stairs that this gate will fit. When the gate is fully extended out it measures about 4 ft. We have 2 of these gates, one is in our wide hallway which measures 40.5 inches wide and this gate is perfect! 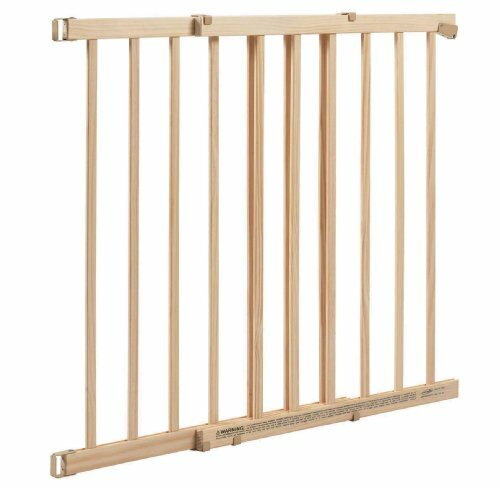 Q:I’d like to find a wooden gate that matches my floors, but have had trouble finding this. Can this gate be stained or is their a finish on it? Q:Can this gate be popped off/on the hardware? We want something we can put up for everyday use and take down for a day if we have a party or something. Yes you can remove the gate and just the brackets will remain on the wall. Q:Can this gate be mounted if I have posts on each side (no walls)? I would think so. I would just make sure the post you are mounting to is sturdy enough to accommodate the swinging gate. 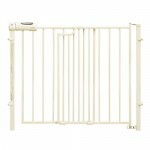 Q:Will this gate be able to accommodate a top mounting width that is a little different than the bottom mounting width? Maybe if they’re not more than .5″ different. It only lock latches on the top so that would need to be the narrower width. The bottom doesn’t latch, it just slides into a metal bracket, so it could still close and latch on top if the bottom is a little wider. If the width was too different, the top might still latch, but a child could push on the bottom and get an arm/leg/head through so you might have to modify the bottom bracket by using a piece of filler wood between the bracket and the wall. Q:Are you able to use this if one of the mounting sides is a bannister? 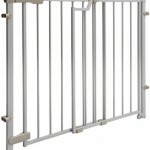 Q:Does anyone know the difference between this and the Evenflo Top of Stairs Gate Plus? Seems to be same. I got two of this one and we love it. Q:The xtra tall seems to be fairly similar to the Plus….but $10 cheaper. Is there any reason to get the plus? 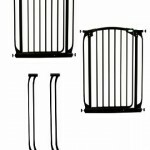 The extra tall stair gate works great and is easy to maneuver. I am not familiar with the plus. Q:What is the distance between the posts – looking to use for cats? The distance between the posts (horizontal bars) is 2 7/8 inches. So I guess it would depend on the size of your cats. We are using it to keep the grandchildren from tumbling down the basement stairs, but we mounted it high enough off the floor so that our cats could get under it to have access to their basement catboxes.